With more advancements in brain science over past decades, Herzberg’s psychological studies have been given deeper scientific substance. Today, neuroscience (the study of the nervous system) can explain the fundamentals of human motivation at a molecular level. This makes me question: how can we leverage neuroscience findings to help optimize employee engagement initiatives? 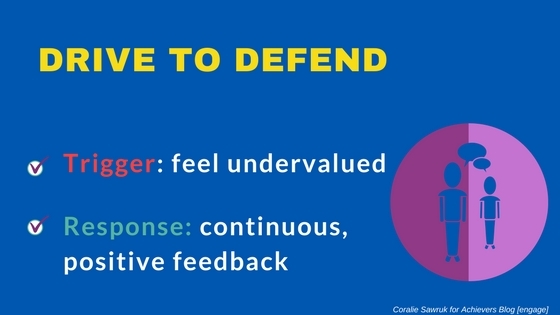 Drive to Defend: this is the only brain circuit triggered when people feel threatened.The most common “threat” at work is to feel undervalued. Usually triggered by lack of feedback or line manager interactions, it can be fixed through continuous, positive feedback. 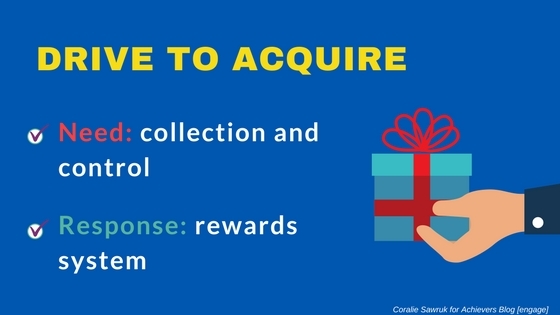 Drive to Acquire: the need to seek, to take control, and to retain objects and personal experiences of value in pursuit of immediate gratification.This can be fulfilled with short term gratification through employee recognition and rewards. 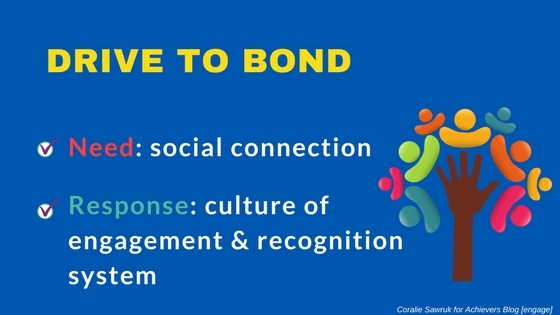 Drive to Bond: the brain is wired to be social, and this drive allows like-minded people with shared interests to work cooperatively together.This is strengthened by a company culture where collaboration is valued, and leaders positively “walk the talk”. Drive to Learn: The natural desire to make sense of our world and ourselves. It exists in a cooperative atmosphere where curiosity is rewarded and knowledge freely shared.Through appreciation and gratitude, you can encourage creativity and learning. Did you know that our brain interprets “social pain” much like physical pain? This is the conclusion of the work by Naomi Eisenberger, Psychologist at UCLA. Let’s take employee feedback and annual reviews for instance. If sporadic, people can experience those as an attack on their “status”. The brain is quick to perceive feedback like a physical attack, and reacts with a defensive strategy. Access to constant feedback is now real. Achievers recently released Listen, where employees can provide feedback to management on their day-to-day issues via check-ins and pulse surveys. Achievers’ Listen goes even a step further, taking into consideration the importance of positive feedback. Allie, an intelligent, digital “coach”; interacts with employees in a familiar conversational way, while guiding employees with effective feedback and providing recommendations back to managers. The value of incentives to motivate employees has been debated for long. Still, money can be effective to express appreciation: a survey by Harris Interactive and Glassdoor revealed that 75% of employees consider a pay raise as a form of appreciation. But some leaders argue material gifts are a short-term fix only. What does neuroscience to say about it? Receiving a gift triggers an immediate dopamine response in the brain. Described initially by Wolfram Schultzreward more than 30 years ago, reward systems in the brain heavily influences our behavior. Achievers’ platform is a good example of alternatives to cash bonuses. Through points-based employee recognition, each employee can receive monetary and non-monetary based rewards and recognition. And it works! As shared at ACE 2017, organizations using a rewards and recognition technology solution reported better levels of employee engagement, employee retention, and productivity over the course of a year. Promoting social bonds is a pivotal dimension of employee engagement. As organizations go global, a common platform to share and connect is a simple way to tap into social drive. Employee recognition can directly impact employee engagement levels. 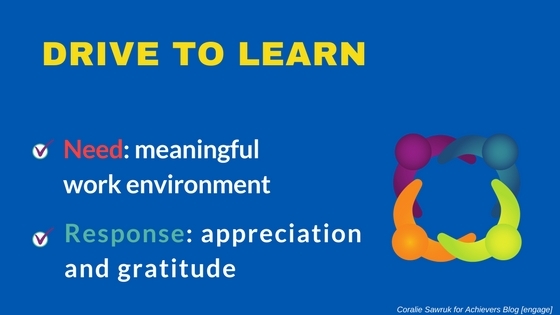 As the brain responds to gratitude with a positive feedback loop, needless to say that a recognition-based culture can do more than a feel-good effect! The by-products of gratitude at work are serious business assets, such as enhanced creativity, increased happiness and productivity, and better cooperation within teams. By aligning your employee engagement strategies to main human motivation drivers, you tap into dopamine reward loops and create a lasting positive feeling. What is the value behind employee engagement? To learn more, download this white paper covering The True Cost of Disengagement. Coralie shares her insights on human-centric leadership and leading happy teams on her website. Neurotoxins: Basic and Advanced Techniques is organized by Vindico Medical Education and will be held from Mar 06, 2018 – Mar 05, 2019. The target audience for this medical event is comprehensive ophthalmologists, dermatologists, nurse practitioners, physician assistants, and other healthcare professionals involved in the treatment of patients having facial aesthetic procedures. Thank you Robert for sharing your comment!